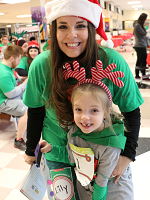 Emily is honored to be chairing the Jingle Bell Run Salt Lake City for the second year now. Her daughter, Lily, was diagnosed with polyarticular juvenile idiopathic arthritis when she was just one year old. At the time, Emily had no idea kids could get arthritis. Lily’s diagnosis turned their world upside down and started a lifelong journey of treatments, doctors appointments, and hospitals that they could never have imagined. Emily's work for the Arthritis Foundation is dedicated to finding a cure for all people suffering from arthritis, but especially for Lily and the 300,000 other children in the United States living with juvenile arthritis. 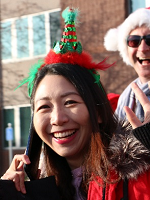 The Jingle Bell Run is a fantastic chance for families to come together for a fun and worthwhile cause. Come jingle with us! Join Emily in the fight against arthritis, register or donate today! Dr. Celine Lee is originally from Seoul, South Korea. After earning her medical degree at Korea University in 2002, she completed her dermatology residency and initially worked as dermatologist for several years. Highly interested in various rheumatic diseases she encountered while working as a dermatologist, she decided to move to the United Sates to further specialize in rheumatology. She completed her internal medicine residency at Albert Einstein Medical Center in Philadelphia, Pennsylvania, and her rheumatology fellowship at UCLA in Los Angeles, California. During her rheumatology fellowship her background in dermatology has been pivotal in treating rheumatic skin diseases. She has published multiple scientific papers and was awarded for her research in both dermatology and rheumatology fields. Dr. Lee and her husband moved to Salt Lake City to join Intermountain Healthcare. They are very excited about living in Salt Lake. In their spare time, they enjoy hiking, biking, camping and observing the night sky using their amateur telescope. Join Dr. Lee and the fight against arthritis, register or donate today! Abby Jones is an energetic 19-year-old who was diagnosed with rheumatoid arthritis at the age of three. This sixteen year battle has shaped her into the person she is today. She loves to dance and to go boating with her family. She does not let this disease define who she is; she rises above and tries to be a mentor to young kids with arthritis. 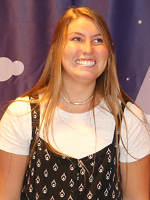 Abby is a sophomore at Utah Valley University studying Exercise Science and Pre-Physical Therapy. Abby would like to thank the Arthritis Foundation for allowing a safe place for people with Arthritis to connect and creating such a supportive community. Join Abby in the fight against arthritis, register or donate today! Trinity believes in three things - hope, trust, and Hakuna Matata. Hope – she’s been hoping for the most amazing thoughts. She believes if she keeps hoping, it will come true at some point. 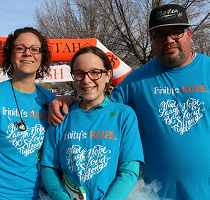 Trust is very important because if “you don’t trust you aren’t’ going to get anywhere.” Trinity trusts in God, her parents, her doctors and most importantly herself. Lastly, Hakuna Matata, for those who haven’t seen the Lion King, it means “no worries.” Trinity believes she will one day be in remission. She wants the world to know that arthritis won’t stop her. Join Trinity in her fight against arthritis, register or donate today!